Spend time trying out different beds for conformity to shape. When buying a single bed choose one with a firm base. Consider your height and weight when assessing the degree of firmness required. Have a mattress which supports the spine but also allows the hips and shoulders to sink in when lying on your side. The height of the bed is important. When sitting on the edge of the bed the feet must touch the floor. When buying a bed for two people they should both try it. If one person gets off a double bed the other one should not feel any movement. A very firm mattress can be relieved by covering the bed with a layer of foam or sheepskin. 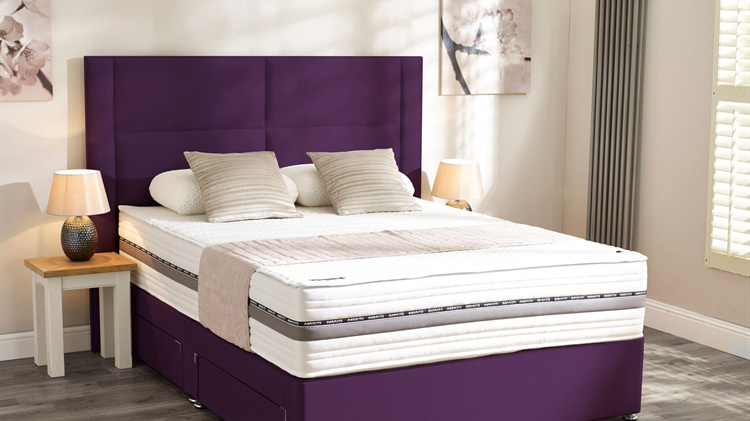 For travelling or home a bed board can be used under a mattress to make it firmer. Find out which position is best for lying. If you lie on your back try a pillow beneath your knees. Always roll onto the least painful side before getting in and out of bed. Adjustable beds are good for chronic back sufferers and assist elderly people to be able to find a more comfortable position. Lie flat on the bed and slide the hand into the small of the back. If there is a gap the mattress is probably too hard. If you cannot push your hand in easily the bed is too soft. Roll from side to side. If it is difficult to roll the mattress is too soft. Have enough width to turn to and fro and to turn over. 5' is the minimum. 5'6" -6' is better when buying a bed. Sleep is the all important regenerative period for the mind and body. Maximum relaxation comes from the anatomically correct posture of the back so there are no discomfort signals. You spend an average a third of your life in bed so it is essential to spend time choosing a bed, and its accessories, to enhance the quality of life. The optimum comfortable position is where the spine is an 'S' shape when viewed from the side and in a straight line when viewed from the back on a firm mattress. If the mattress is too hard a 'billiard table' effect causes discomfort to the hips and shoulders and distortion of the back. On a mattress which is worn out, soft and sagging with broken springs, a 'hammock' effect occurs which gives the spine no support. A bed board under the mattress will help. When getting in sit on the mattress. Lower the body onto the shoulder. Bend up the knees until the feet can slide onto the bed then rollover onto the back. Reverse when getting out. Always bend the knees. When making a bed do not stretch across, go round the other side. Use a duvet or fitted sheet where possible. Kneel or bend the knees to tuck in the sheets and use both hands to avoid twisting. Put one foot up on the bed to pull off the sheets.